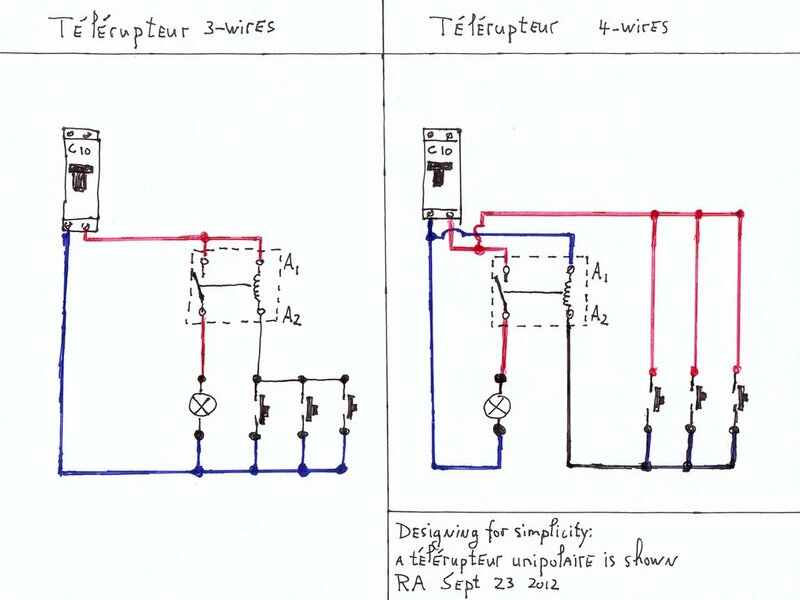 Télérupteurs: how to wire them. 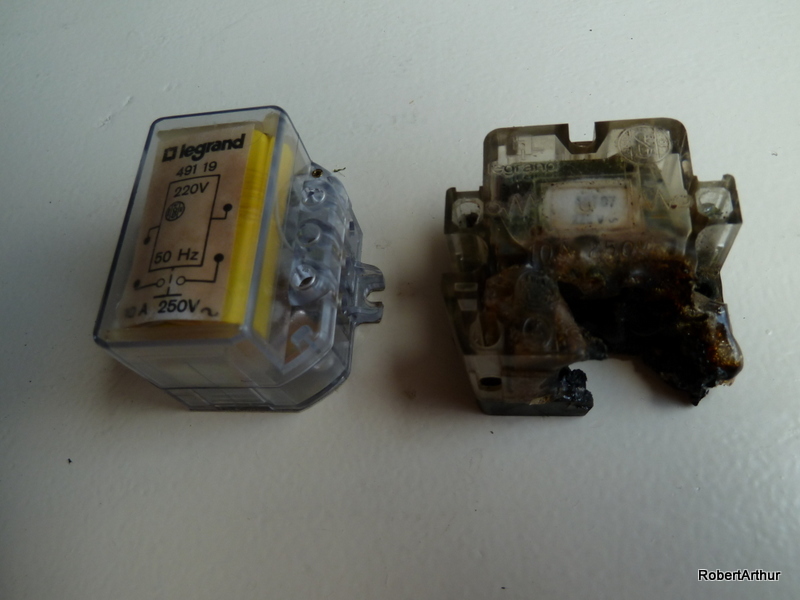 FrenchEntrée › The Forum › French Property Matters › French Electrical & Other Building Issues › Télérupteurs: how to wire them. Minister Arnaud Montebourg should be proud of this French invention: the télérupteur. There are rumours however that his socialist friends in East Germany were first, with even more clever solutions, but that’s for Wikileaks to bring to the attention of the public at large. How to wire these télérupteurs? Two diagrams: 3- wire and 4-wire. The obvious advantage of the 3-wire method is less wiring, and you can do it “local”: in the neighboorhood of the switches – boutons poussoir – and the lighting. But personally I prefer the 4-wire approach, for several reasons. Not for the first time the telephone rang: Robert, il-y-a un problème ici avec l’éclairage. Went over, and finally discovered, after constructing a pathway in the attic with beams and floorboards, an open boîte, et le voila: a suitable case for treatment, a télérupteur with a burnout. The familiar block type, for use in boîtes that take you sometimes hours to discover where they are hiding. But looking at this picture: they have been lucky there, could have started a fire. And they would have noticed it much too late: no early warning smell of something going wrong. 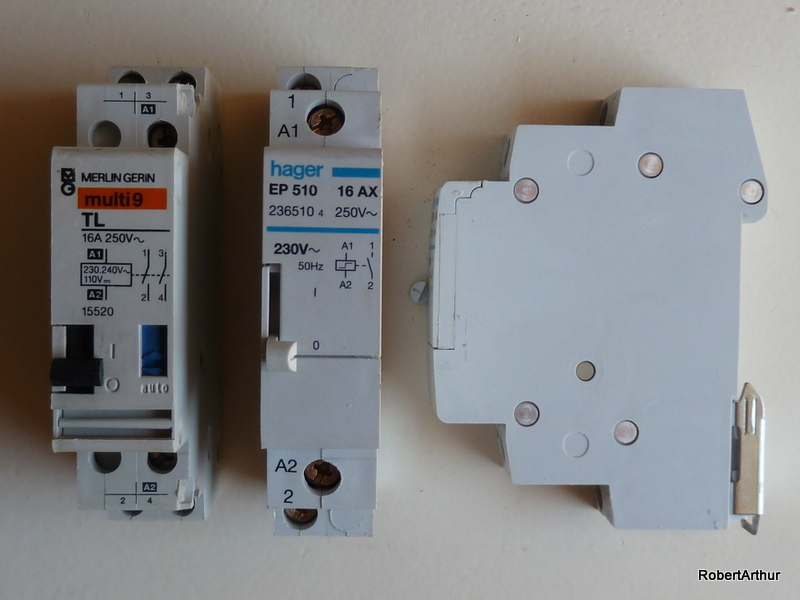 That’s one of the reasons why I prefer the more expensive 4-wire method, with télérupteurs in the consumer unit. Easier access, and with the benefit of an earlier feedback (smell) if something goes wrong. Robert, on mine, it’s wired like that. It can be controlled from any one of four positions, but ONE of them doesn’t always result in it operating. A firmer push rectifies the fault. I assume this will be down to a poor bouton poussoir? They are Legrand surface mount, as is the TR. Thankyou, I think it can be replaced next time I’m out there.